Your presence, your gift and a few special words are all the ingredients to make your friend’s wedding more special for him/her. The two first are generally more easy to find, but when it comes to words, there is often a huge problem. Many things to say and so little space in a single wedding card. 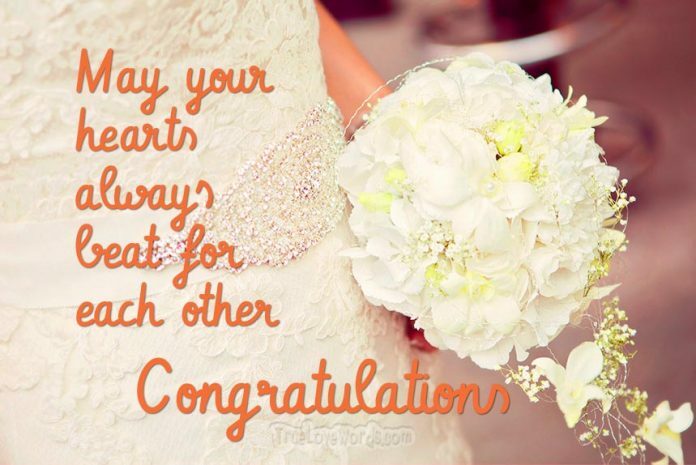 No worries, because below you can find a bunch of beautiful wedding day wishes for friends that can make fit in anybody’s heart! ¤ I/we couldn’t be happier for this fusion of souls, this merger of hearts, this blending of dreams. May you always be happy together. ¤ As you enter into this beautiful covenant, may the desires of your hearts always remain true to each other. 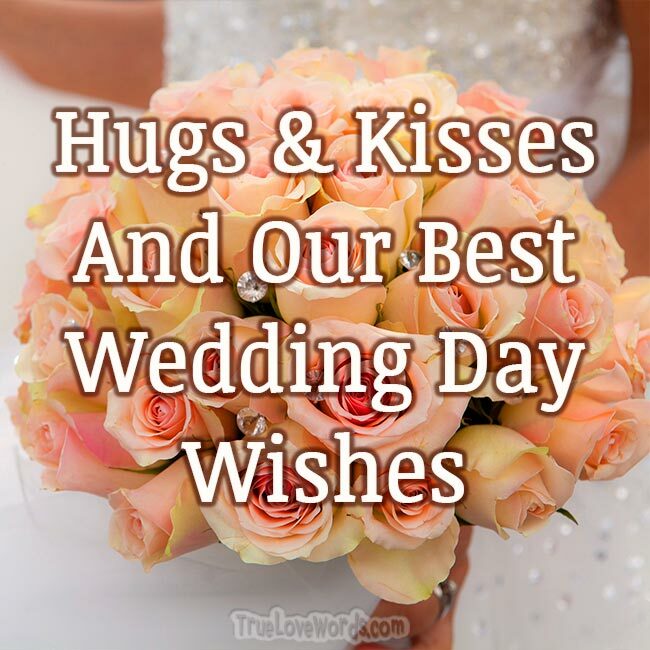 Hugs, kisses and our best wedding day wishes. ¤ The secret to a happy marriage is no secret at all. It’s simply love, in every act, substantial or small. Wishing you a lifetime of love and happiness. ¤ One good thing about growing old together is that the more wrinkly and gray you get, the more your spouse’s eyesight declines. May you have a happy married life pal! ¤ You are one smart cookie for marrying your woman. Just don’t leave crumbs on the floor. May the happiness, love and joy you feel today shine forever. ¤ A new adventure has just began. Enjoy every single moment of your new and mysterious challenge! ¤ Here’s the secret to a long marriage: No matter what the day has brought, go to bed with a little kiss, and always touch toes. Congratulations! ¤ Honor, cherish, love, respect. Converse, encourage, kiss, reflect. Happy marrying! ¤ As your “once upon a time” unfolds, may each chapter be filled with success, each page written with love. ¤ May God bless you with a home full of love, life, loyalty, and laughter. ¤ Though your wedding day will not last long, may your marriage be a forever love song. ¤ May your hearts always beat for each other as you begin one of life’s most beautiful journeys. ¤ Marriage is a beautiful convergence of two journeys. May the roads of life lead you to adventure. ¤ Today, the final pieces of the puzzle have been put in place creating a magnificent scene of the love you share. May your marriage be picture perfect always. ¤ The hearts of everyone here are overflowing with love for the two of you on this special day. I/we hope you will always feel the love. ¤ Many years from today, you will have created a photo album of lives shared, children raised, and amazing adventures. May it always bring you joy; Congratulations. ¤ All the love songs and poems in the world were written for you. May you live them out each day. ¤ Heaven rejoices as two become one. Congratulations on your wedding day! ¤ As you look through the lens of life, may love be your focal point today and always. ¤ You have found the greatest gift of all–love. May you rejoice in it all the days of your lives. ¤ As you walk the path of life together, may you always hold hands. Lots of love today and beyond. ¤ As the story of your life is penned, may each word be dipped in the inkwell of love. ¤ Through smiling eyes, your love shines brightly for all to see. Congratulations on finding the perfect person to spend the rest of your life with. ¤ The most beautiful design is emerging as the threads of your lives are woven together today. May your love always keep you warm. ¤ Time does not stand still, so make every effort to fill each second of your marriage with love and kindness. Congratulations; stay this happy forever! ¤ Marriage is a flourishing garden, fragrant and full of beauty. Be sure to nourish yours with abundant love, and shower it with gracious acts of kindness each day. ¤ May the ultimate goal of each day of your marriage be to love and protect the heart of your betrothed, surrounding it with grace and mercy. ¤ Marriage is a crackling fire, cheerful and bright, that burns down to beautiful glowing embers ready to be rekindled. May your fire never go out. ¤ May your rope be strong, and your knot be tight. May your marriage be long, and your love be bright. ¤ As God molds your lives into a beautiful piece of art, may you allow Him to soften your hearts and paint amazing scenes on this masterpiece He has created. ¤ Marriage is when two love birds soar into the sky of their dreams. May your wings stay strong and your skies always be bright. ¤ May you wake up each day to new possibilities and fresh ideas. Enjoy each moment of your marriage. ¤ May all your days be sunny, but if you get caught in the rain, sing and dance anyway. Congratulations on your wedding my friend! ¤ Once upon a wedding, there was a blissful union of two souls. May you live happily ever after. ¤ Some people wish upon a star, and some throw coins in a fountain. But I/we wish upon a wedding–may every dream come true for you today and always. ¤ Here’s hoping you can mark everything off your wish list today. May God grant you all of life’s blessings and love’s joys. 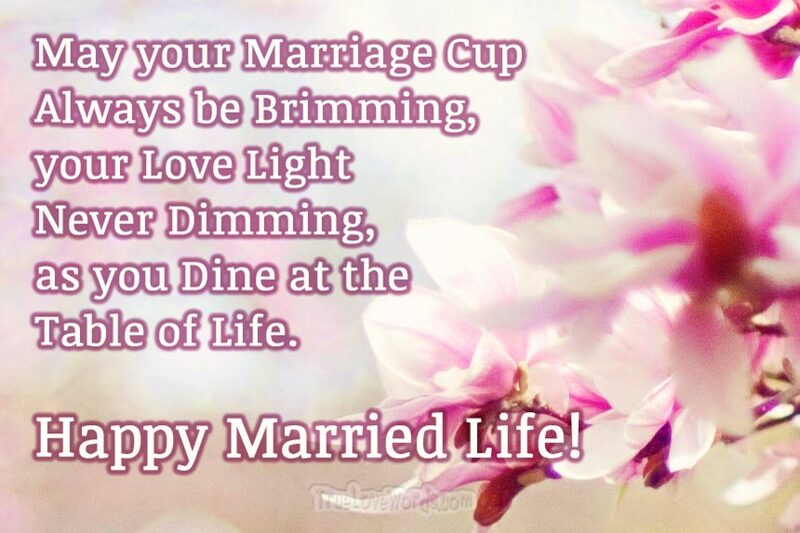 ¤ May your marriage cup always be brimming, your love light never dimming, as you dine at the table of life. ¤ May the heavenly glow of your wedding day shine throughout the rest of your lives. ¤ (for husbands only) Quick! Burn this date into your brain so that you will never be in trouble for forgetting your anniversary! ¤ The secret to a happy marriage is … buried so deep that no one has ever discovered it! May the years ahead be filled with lasting fun and joy. Good luck my friend! 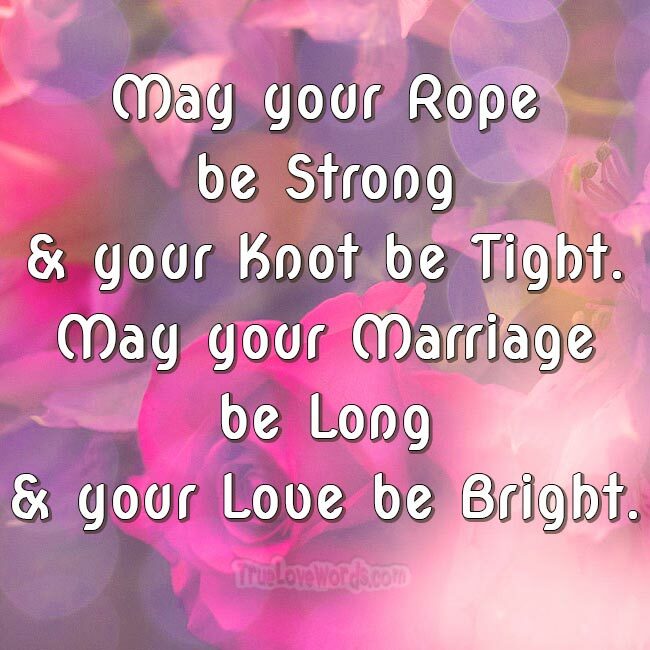 ¤ May the love knot that you are tying today not get tangled around your feet! ¤ After today, you will have someone to complain with, overeat with, and share the remote with. May your wedding day be the beginning of a long, happy life together. Enjoy! ¤ Here’s hoping you always say goodnight with a kiss. ¤ Today you become two peas in a pod. May the butter of love melt all around you and the salt of happiness sprinkle over you. ¤ He promises to lay down his life for you, but before you know it he won’t even lay down the remote for you! ¤ As you walk down the aisle, be sure to locate the exit signs just in case. May you always be steadfast together. Love you! ¤ For a happy marriage, do everything together naked. Except frying bacon. Don’t do that.